without a significant loss of accuracy because the change in the strength of the Earth's gravitational field is small. 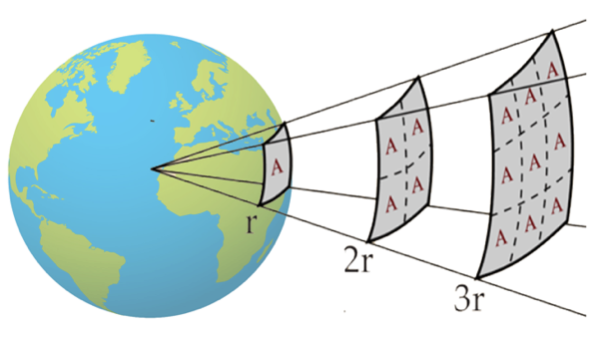 We cannot use this simple equation when distances are large, that is similar to or greater than the radius of the Earth, because the force of gravity reduces to a fraction of its value when the distances are large. At a height from the surface equal to the Earth's radius the force of attraction is only one quarter of that near the surface. If we rise to twice that height, that is three radii from the centre, the force will only be one ninth. To calculate the energy change when something is lifted or falls a large distance we need to find the gravitational potential at the start and at the end, subtract the two and then multiply by the mass moved. As the height increases the force gradually decreases. Work done equals mgh but we have to take the changing value of g into account. The expression circled -GMe /r is the gravitational potential.